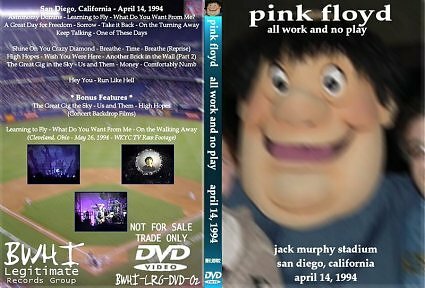 42 years ago today -- 10/18/70 -- Pink Floyd performed in San Diego for the first time at the Intercollegiate Baseball Facility (a.k.a. the Polo Field) at UCSD. Touring behind their Atom Heart Mother album, they had played the previous month for their largest audience ever -- over 500,000 people -- in Paris. 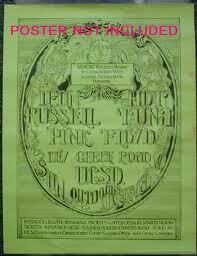 Despite their popularity in Europe, Floyd was third on the San Diego bill, behind Hot Tuna and Leon Russell (note poster below lists Floyd as "special guest"). Presented by the ASUCSD Program Board in conjunction with Sunrise and KPRI, tickets cost $3.50 for the general-admission show, which started at noon (gates opened at 10am). "There was a big marijuana protest on the grounds at the same time," recalls one-time concert promoter Dan Tee, a member of UCSD's Student Body Council at the time and one of the people behind the show. "About a hundred people were carrying signs and chanting 'legalize it, legalize it,' and it seemed like there were at least that many cops around too. "[The protestors] weren't too organized, though. Before long, most of them were going into the concert instead of protesting.... We used a bunch of their [abandoned] sign poles to prop up a temporary fence that gate-crashers tore down to get into the concert." 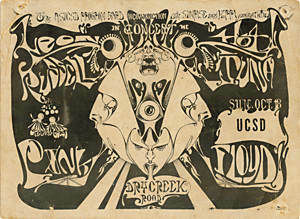 The San Diego date was one of the few where the experimental song "Alan's Psychedelic Breakfast" was performed by the band. "They actually sat at a little folding table and ate for part of the song," says Tee, "with tapes of voices and sound effects playing in the background." 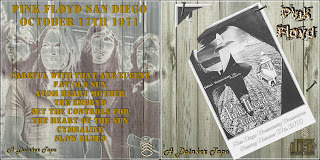 The band returned to San Diego one year later -- 10/17/71 -- to play a show at the old Convention Center that became widely bootlegged. 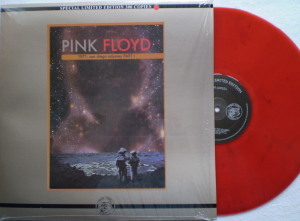 "This is post-Syd pre-Dark Side Floyd at the height of their jamming power...each instrument is clear and, for a change, Rick [Wright]'s organ is played up in the mix." "Possibly the best currently available show from the fall 1971 shows...'Fat Old Sun' is the extended version, with an extra verse sung before the jam." "PF shows off their quad sound effects. The music fades out and somebody enters through a door, walks around in the room opening doors with different sounds behind them. After a while, 'Cymbaline' fades in again." Among the many bootlegs available of this performance, From Oblivion appears to have the closest to a complete setlist, now available on CD and frequently auctioned through eBay. 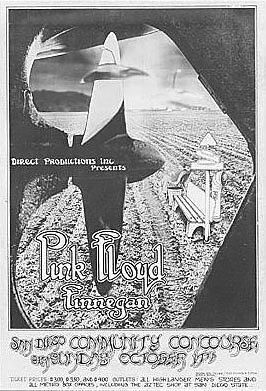 The show was opened by the band Finnegan. 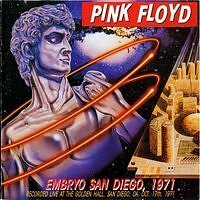 9-16-72 - Pink Floyd at Golden Hall performing Dark Side of the Moon. 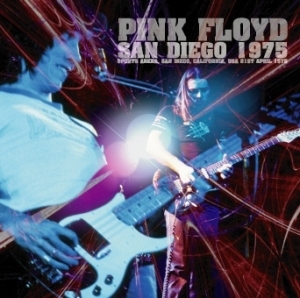 4-14-94 – Pink Floyd at Jack Murphy Stadium: "I could easily smell the burning stench of our failed drug laws," wrote Reader columnist Allan Peterson about Pink Floyd's first San Diego concert in 19 years. 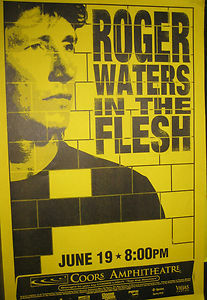 The immense scope of the elaborate show, with all its effects, movie screens, inflatable animals, and (excellent) quad sound, is not what ranks this show (sans the "real" Pink, Roger Waters) among great and historic local events. Rather, it was the stirring performance of "The Great Gig in the Sky." Peterson says, "Singer Durga McBroom's take on that classic piece was seamlessly compelling and contained all that one could hope for: longing, sadness, acceptance, raw beauty...the terrifying immediacy of mortality, the telling reality of loss." I felt the same chill down my spine during the rendition and, eighteen years later, that's "the moment" everyone I know who was there still raves about. Bootleg aficionados apparently agree, usually ranking this date, and that performance of "Great Gig," among the best of the entire U.S. tour. Dave Gilmour, June 20, 1984 - SDSU Outdoor Amphitheatre, with Mick Ralphs (Mott the Hoople), Mickey Feat, Gregg Dechart, Raff Ravenscroft, Jodi Linscott, and Chris Slade. Roger Waters, September 23,1987 - Radio KAOS tour, Sports Arena, with Graham Broad, Paul Carrack, Doreen Chanter, Mel Collins, DJ Jim Ladd, Andy Fairweather Low, Katie Kissoon, and Jay Stapley. 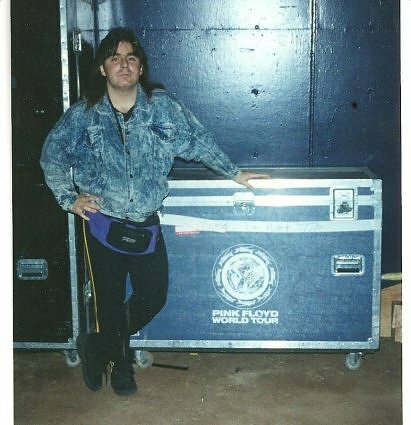 And of course the Pink Floyd Experience comic book series was created and published in San Diego in 1992, courtesy of Hillcrest-based Revolutionary Comics, home of Rock 'N' Roll Comics. All five issues were collected in a graphic novel last year by Bluewater Productions. crflick Dec. 30, 2012 @ 8:39 p.m.
Nice! I saw them the first time 41 years ago at the '71 Community Concourse concert and I have that recording From Oblivion on CD. That show was at the Golden Hall and the place was half full. It was my second rock concert ever. I was 15 and just started 10th grade at La Jolla High School... I saw P.F. 5 times more after that but never in S.D...Every one sold-out. Twice at L.A. Sports Arena in '75 doing Wish You Were Here and Dark Side of the Moon (the second show was the one I was on the center aisle on the floor and walked up to the front of the stage to watch them play the encore Echoes for a half an hour about 10 feet away), at Anaheim Stadium in '77 doing Animals and Wish You Were Here (The one with the double rainbow, a great concert, but it was a violent, drunk crowd, and a totally unpleasant experience), at L.A. Sports Arena again in '80 doing The Wall (Drove from Ashland Oregon with a friend, snuck in a 35mm camera and shot a whole roll of film, then reloaded the same roll in the dark accidentally. All the pics turned out fantastic double exposures. I sold those pics and made back all the cost of the trip! 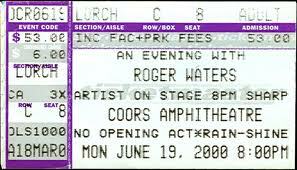 ), and finally at Oakland Arena in '87 without Waters. Best live concerts ever! 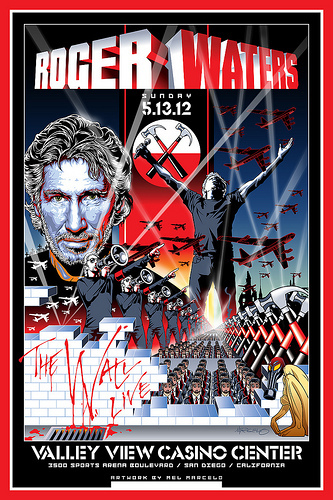 Then I saw Waters do The Wall Live twice...Indoors at Honda Center in Anaheim 2010 and the amazing show outdoors at L.A. Coliseum in May this year. Thanks for writing the article and reminding me of those great stories.